 The most important service in Orthodoxy is the Divine Liturgy, also known as the Holy Eucharist, and is performed every Sunday morning at Holy Trinity Greek Orthodox Cathedral. During this experience, worship is not only expressed in words, but also in hymns, gestures, processions, and scents. The Divine Liturgy involves all of the participants senses, feelings and intellect. The congregation remains involved in the worship service by responding to petitions, making the sign of the Cross, bowing, saying ‘Amen’ and, most importantly, receiving Holy Communion. The preferred posture in the Orthodox Church is standing and many prayers are presented that way. The congregation may kneel during certain solemn moments, such as the Invocation of the Holy Spirit. The Divine Liturgy is ritualistic with many unchanging elements that follow a specific order and framework. This preserves a continuity with the past and the worldwide Church. The whole Church is responsible for the regulating of the Divine Liturgy and other services. It is not left to the discretion of a particular priest or congregation. This serves to guard against error and preserve the true Faith. At Holy Trinity, we celebrate the Divine Liturgy in two languages, Greek and English. There is no official liturgical language and is usually in the language of the congregation. Services are celebrated in more than twenty languages around the world, including Greek, Slavonic, Arabic, Albanian, Romanian, English, and Luganda. The Liturgy starts with a blessing of the Kingdom of God, which includes the Sacred Body of Christ on earth; His Church. They are small prayers which the priest offers especially for the peace of the world, with the people responding, Kyrie eleison; Lord, have mercy. These are readings from the Old Testament, especially from Psalms 102 and 145, with refrains of Christian meanings and specifically references to the Resurrection of Jesus Christ. This entry represents the ancient practice when the priest took the Gospel by the light of torches from the crypt, an underground safeguard to protect the Gospel from destruction by the pagans, bringing it up to the Church. The priest lifts up the Gospel and exclaims: “Wisdom,” which means Christ, and calls the people to worship and bow down to Christ. A short prayer praising the Holiness of God. It is incorporated as an exhortation from the priest to the people on the Good News of salvation. (The part of the service for the Catechumens is now omitted). This is a proclamation of the Holy Trinity in connection with brotherhood. It is chanted now before the Nicaean Creed. This is the concise and accurate confession of the Christian faith in 12 articles formulated by 1st, 2nd Ecumenical Synod at Nicaea in 325 A.D. (The Nicaean Creed is recited during every Liturgy, an addition made in the 9th century; prior to that time it was recited only during the Liturgy at Easter). It includes dialogues of excerpts from the long prayer of sanctification which is now read inaudibly by the priest and which, in fact, is the very heart of the significance of the Divine Liturgy. The dialogues start with the offering of the Oblation (the Species, Bread and Wine), continues with blessings and the actual words of the Lord, “this is my body … this is my blood,” and climax in the sanctification of the Species. Now the Bread and Wine are lifted by the priest, who exclaims, “Thine own of Thine own we offer to Thee, O Lord.” At this time, generally the people kneel, and the choir sings: “We praise thee… we give thanks to thee, O Lord”. In continuation, the priest commemorates the Saints and especially the Virgin Mary, as well as the faithful ones. These are small prayers referring to the spiritual welfare of the city, the nation, the Church and the individual. It is recited by the people; the priest follows it with the exaltation. At this point the priest elevates the Lamb (the consecrated Bread) saying: “The Holy things for those who are holy,” and breaks it in commemoration of the actual Eucharist. Also at this time the priest pours warm water, zeon, into the Chalice, a reminiscence of the very primitive Church (see, Justin the Martyr). Now the doors of the Altar are generally closed and the priest partakes of the Holy Gifts separately and then combines both Elements into the Chalice; a later practice of the Church. Both the Holy Body and Precious Blood of Christ, combined in the Chalice, are given to the prepared faithful when the priest calls them to “draw near with reverence.” In ancient times the Holy Gifts were given to the faithful separately, first the Body and then the Cup, from which the faithful drank in turn, as is the continued practice for the clergymen today. These are prayers of gratitude to Almighty God for the privilege which is given to the faithful to commune with Him. The priest calls the people to depart with a prayer by which he asks the Lord to “save Thy people and bless Thine inheritance.” In conclusion he blesses the people, saying, “May the blessing of the Lord come upon you.” The people seal the Liturgy by responding, “Amen.” Blessed bread, antithoron, which means “instead of the Gift,” is given to all at the conclusion of the Divine Liturgy. As material food nourishes and sustains our physical bodies, so does the Holy Eucharist nourish and sustain our souls in sacramental union with God. 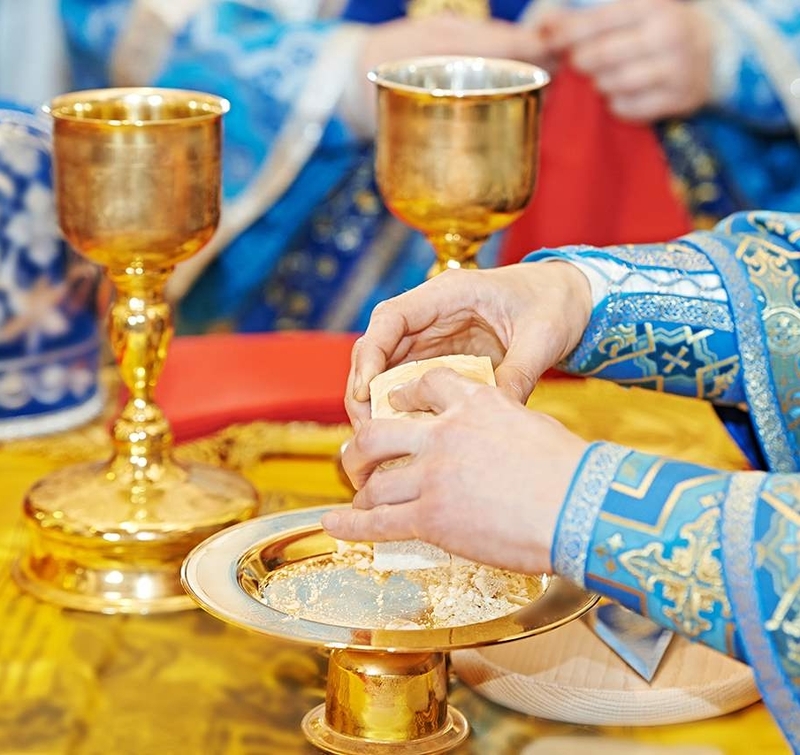 Orthodox Christians (who have been baptized and chrismated into the faith) prepare themselves prayerfully and responsibly for the acceptance of Holy Communion. Then, after proper preparation Orthodox Christians may approach the Holy Chalice of the Lord reverently during the Divine Liturgy. This proper preparation includes fasting, confession and the prayers before we receive Holy Communion along with the Thanksgiving Prayers after we commune. Orthodox faithful are encouraged to participate in the weekly Eucharist, including children whose early Christian upbringing in the church is critical to their overall spiritual formation as active and serious members of Christ’s Holy Body of believers. If a person is confined to bed and cannot attend the Divine Liturgy at church, call our priest and he will make arrangements to visit the person and offer him or her Holy Communion. Kindly call in advance to make arrangements, unless it is an emergency. Visit our Cathedral and experience the beauty of the Divine Liturgy.